ABC has a bartending school located in West Los Angeles, CA. 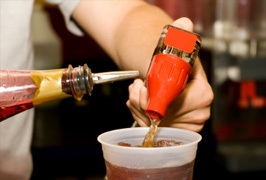 ABC is the largest privately owned bartending school system in the Nation. Tony Sylvester has owned bartending schools and has been placing bartenders nationwide since 1977. Tony Sylvester has been placing bartenders nationally since 1977 and brings to his schools the art of matching the right face to the right place. Take a look at this job placement list for the Los Angeles West, CA area, and the nationwide chains that have hired our students.